Despite the gloomy and (thankfully) cool weather when we all just want to lie down motionlessly on our comfy beds with our hands under the cool side of the pillow (who else does this?) I'm pulling up my sleeves and getting my blogging-chops back on high-gear because I have a new review! 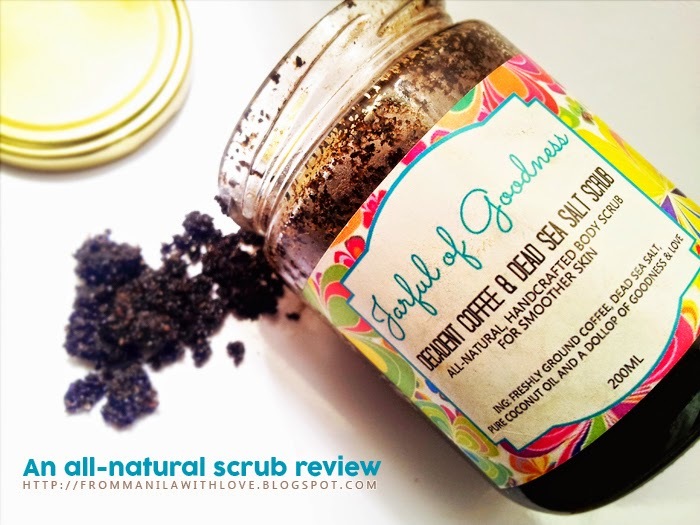 This time on a very delicious-smelling scrub Melanie sent me from Jarful of goodness. Read on to see what I think. I know how much you love your dead skin cells clinging to you, making you look pasty and a little bit sick , but exfoliating is quite important not only to improve texture by getting rid of dead skin-cells and unclogging the pores, it also to helps circulate the blood flow in the body. Oh and makes products you apply on your skin work better. (since, you know the dead skin cells aren't blocking the pores anymore) Don't believe me? Here are some other benefits of exfoliating. It also has a very pretty label, very colorful and eye-catching. The name is also pretty well conceived. I mean who wouldn't want a "Jarful of Goodness"? Now I did say "delicious-smelling" but only because I'm a coffee junkie. I like the smell of coffee beans/grounds, whether they're cooked or un-cooked. And this smells exactly like "uncooked" coffee grounds. Probably because these are made from fresh (read : unused) coffee grounds. Using the plastic spoon it came with, I mixed the product inside first then scooped out a spoonful on my hands to work in on my body. As expected, it hurt. Or I may be just a weenie just have a low tolerance for pain. There was no doubt in my mind that these were coffee grounds with salt incorporated in its harsh and lovely roughness. Washing off the scrub, it left me with a thin film of oil - coconut oil. At the first few seconds I felt weird about having oil on my skin whilst in the shower. (I mean I could understand me-being totally dry THEN putting on oil on my body to moisturize it, but in the shower? Apparently not) But after towelling-off, my skin felt really moisturized, even more so than if I'd used my regular body lotion/moisturizer. My skin felt smooth, clean and it smelled so good. The scent doesn't last though. And I've asked my brother "Hey, can you smell my skin?". Which was reciprocated with the indifferent "it smells nice" response. I've tried this for more than 2 weeks to date. Enough time, I believe, to make a conclusion if this is worth it. Because I've been reading stuff about "hidden" harmful chemicals in mass-produced commercial products, I've been leaning more toward finding less harmful beauty items. Said lifestyle is significantly more expensive, I admit, but this is a good start to going organic/all-natural. PS. This was sent to me by Melanie, the entrepreneur behind jarfulofgoodness. Thanks Melanie! Sorry for the delay. 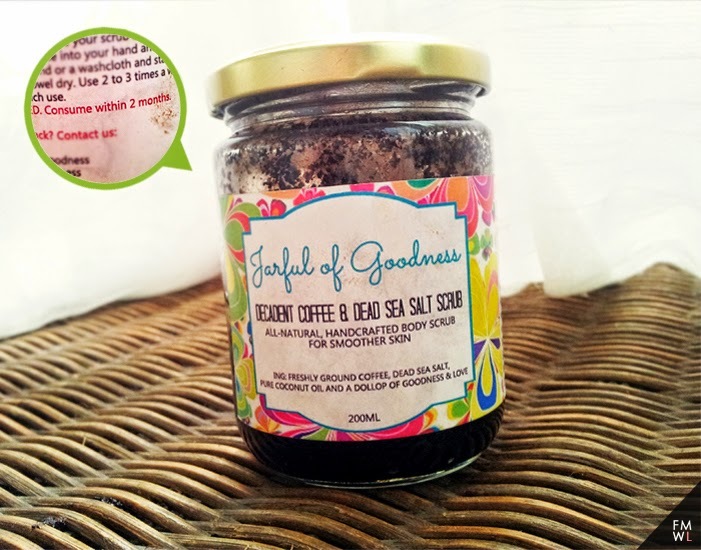 My mom actually uses ground barako coffee to exfoliate! Smells good, although it's kinda weird to smell coffee in the bathroom. I am a fan of coffee, so I think I will be okay with the smell haha! Looks and sounds appealing to me! I would love to try this.